Highly durable and affordable. These picnic tables maintain high quality at an economical price by using slightly less steel around the edges. Rounded corners for added safety. 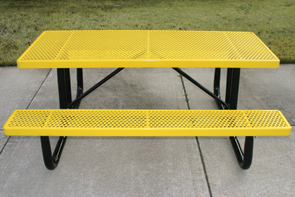 Perforated metal tops and seats on a powder-coated 2-3/8"Welded frame make these traditional tables sturdy and dependable. Powder-Coated frame is constructed as to prevent rain water from collecting at ground level. 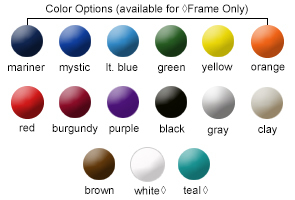 Table top and seats can be finished with a lightly textured Polyethylene in the color options as shown. All wheelchair access rectangular outdoor tables conform to latest ADA specification.